Google Labs launched a neat way to read news online at Google News Timeline. Besides top websites, you can also browse content from top blogs. Just enter the name of any top blog / website and hit the enter key to see its content in timeline format. Sadly, this feature does not work with number of small and even medium blogs. 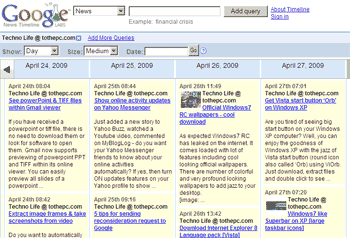 However, as pointed by Gopinath – there is an option to add any blog or website URL and browse its content in timeline format using Google News Timeline. To get started: click on add more query button and you will get options screen. 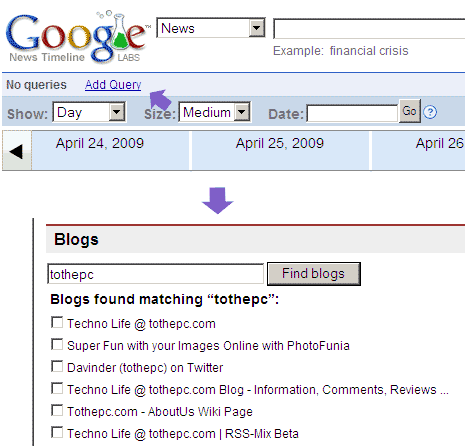 Scroll down and enter name of your blog like tothepc and hit the find blogs button. You will definitely get listing of blog or website you have been searching for. Select among displayed blog results and click save changes button to see your favorite blog content in timeline format. It is neat and very easy to view lot of content in least amount of time and space!